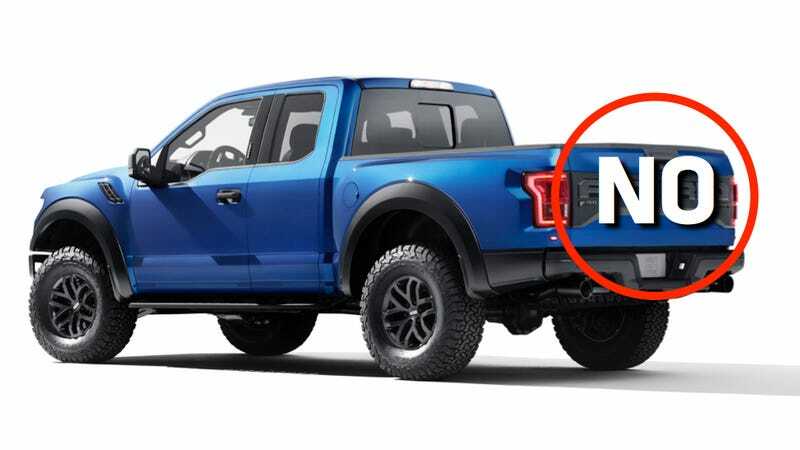 The New Ford Raptor Is Great And All But What The Hell Is This? Hey there, Ford. Great new Raptor you've got there. I like it, I really do. Haven't even driven it yet and I love it love it love it. But it's got a really serious problem in its design, and someone needs to say something before this goes any further. Yeah, I'm talking about that junk on the trunk. Please, Ford, observe that I was only able to fit half the truck into this photo. Any reasonable person would've been able to fit the other half, if only the badge took up less space. Speaking of space, this photo may as well have been taken from space, that's how absurdly large the F O R D badge is. Look, I get it. You're proud of the Ford nameplate, and of the Ford heritage. There's a lot there to be proud of. And drivers of the new Raptor should be proud of the heritage as well. But that's the thing – you should be proud of your heritage. You should let it stand on its own, instead of looking like you're obviously compensating for some inferiority to Ram or somesuch, which isn't even necessary. No Raptor-killers are even on the horizon at this point. And maybe I sound silly protesting that a badge is a bit obnoxious on what must be one the most obnoxious vehicles, if not the most obnoxious vehicle, to hit a production line in the next five years. That may be so. It's an awesomely obnoxious vehicle, it deserves an awesomely obnoxious badge. But in a parking lot, doing the Sunday grocery run? It's going to be ridiculous, much in the same way that screaming the entire discography of Styx is awesomely obnoxious always, but ridiculous if you happen to be doing it in the middle of church. So on a truck whose entire logos is based on being ridiculous amounts of fun, I get why you'd want to cast aside all restraint and put the biggest badge you've got in the world on the back. Hell, it's already got such a badge on the front. It's had one since the last generation. But if one obnoxious badge is just enough, two is definitely too much. A big tattoo on your front is great, but a big tattoo on the lower back? That's just a tramp stamp. Still though, it looks like an awesome truck. It's already something you should be proud of.